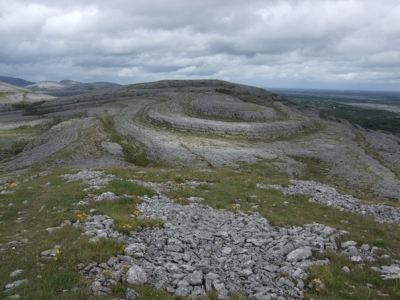 The Burren is part of the Tentative list of Ireland in order to qualify for inclusion in the World Heritage List. I visited the Burren region (nominated as cultural landscape) several times. First feature I visited in the area was Poulnabrone dolmen that is quite touristy place. The dolmen is nice but it does not deserve the inscription to WHS. So, I was not convinced about the outstanding qualities of the Burren at all. It has changed during my visit to the core zone of the national park (photo). The karstic landscape is simply beautiful and fascinating. You can find fossils of corals or seashell almost in every stone. Further, I can admit that the grassy and stony lanscape is there also due to the human impact... All in all, now I can imagine the inscription of the Burren as the cultural landscape! The Burren is quite interesting to see the contrast with the surrounding green landscape. There are Neolithic remains (dolmens) in very good condition. However, I believe this is a very interesting national heritage site and not a WHS.